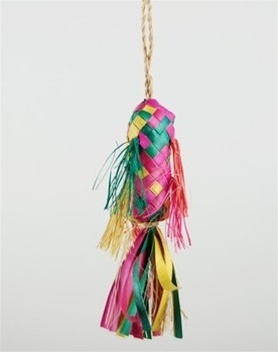 Mini pinata (5" long) for the small birds. 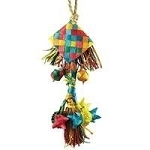 Satisfy your parrots desire to chew and destroy things with a Parrot Pinata! It's two toys in one! A crunchy, hand-woven palm leaf on the outside and natural fibers and shredders tied to a rope on the inside. Parrots will spends countless hours chewing through the outside, just to find a surprising amount of chewing pleasure waiting for them on the inside. Great for birds with feather damaging behaviors! It may be smaller, but it definitely packs just as much fun! Little birds love it! My Conure distroys this in a week, but he has fun doing it. Best price here for this little toy. It may be meant for foraging, but to my keet this is a very popular pull toy! My budgies love chewing on these!